We live in a world where democracy is a threat and freedom is a punishment, where you can’t tell a turd from a diamond, where 5G is trumpeted even as it threatens to kill us, where the prevailing ethos is buyer-beware and where anyone against warmongering and eternal war is smeared and painted as a monster. Who do you believe? All the things you felt certain about Democracy, liberty, the right to free speech, television news, all these things are not only being undermined, in reality, they are being thrown in your face. Democracy in the Nazi-controlled Ukraine, moderate jihadi rebels, no democracy in Russia or Venezuela, despite the fingerprint tests on voters and the voting booth cameras, and this voice saying they’re fair elections and a dozen saying what about France isn’t that democracy and twenty other voices say they’re not and right-wing groups going off in the streets and chemicals in your food and forgetting to turn your wi-fi laden house on before you rush to another meeting or charge your phone, and, and…well…I got lost just writing it. Keeping you busy, that’s what Neo-Liberalist empire does, and amidst it all, you’re meant to be an active citizen stuffed with social capital, capable of an opinion on any topic at the drop of the hat. Ontological security, everybody needs it, but right now it’s in short supply especially in big metropolitan cities. No wonder people are confused and afraid, walking backwards into the future, stuck knee-deep in mud dreaming that somehow, through some miracle, everything will, “Please!”, return to normal. So amidst this Tower of Babble, let’s resolve one conundrum for you. 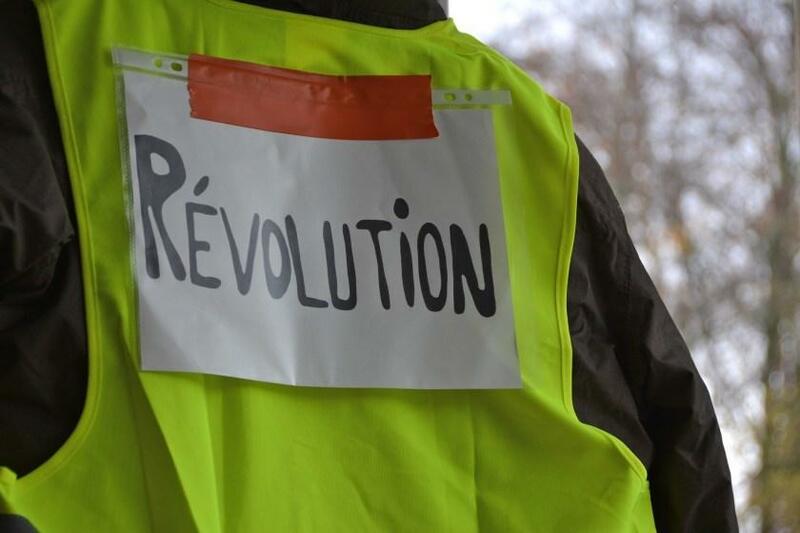 Here are ten reasons the Gilets Jaunes (unlike US sponsored colour revolutions) are the real deal, by which I mean the direct expression of the people of France.